Aluminum plastic medical blister is the waste materials, defective packing, leftover materials produced from pharmaceutical factory or medical institutions. It has single sided aluminum medical blister and two-sided aluminum medical blister. The aluminum content of single sided aluminum medical blister is generally about 10-12% and higher content in two-sided aluminum medical blister. The plastic in medical blister generally is PVC material, and PP material. 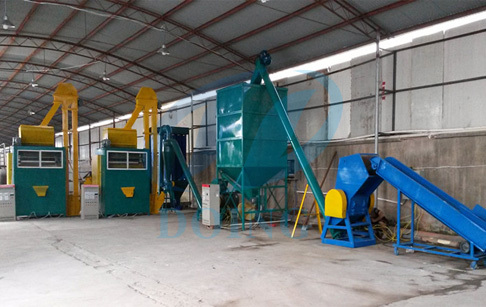 Aluminum plastic medical recycling machine is also called aluminum plastic separator, which is the processing line to separate the waste medical blister to pure aluminum and plastic for recycle use. The aluminum can be used for making aerated aluminum paste, fireworks powder, etc. The plastic can be made into plastic sheet products or other PVC, PP products. Prev:Which common methods for recycling aluminum plastic medical blister? Next:What can we get from waste tires? If you wanna to get more details about What's is aluminum plastic medical blister recycling machine? you can send E-mail to market@doinggroup.com. You can consult our professional engineer and specialized sales team with leave a message in below form.We will contact with you ASAP.You also can visit our factory in Henan,China.Get Detailed address.